By making an offer to purchase, you agree to be bound by the provisions of the agreement (as defined in clause 3.1 below) between you and us. If you do not accept these provisions you should not place an order. It is important your attention is drawn in particular to clauses 10 (limitation of liability) and 11 (indemnity). You must be 16 years or older to register for the service. By submitting an order form (see 2.4 below), you confirm to us that you are at least 16 years of age and that you accept these terms and conditions of purchase. We may change these terms and conditions at any time and we are not under any obligation to notify you of such changes. 2.2 “Invoice” is the form that is shown on screen after you have placed an order, confirming details of the goods which you have offered to purchase and which we have agreed to supply to you. 2.4 “Order form” means the form completed by you online and showing details of goods that you have offered to purchase from us. 2.6 “we/us/our” refers to Littlestarjewellery.com, Little Star Jewellery Ltd, a company incorporated in England and Wales and having a registered office at 63 Meneage Street, Helston, Cornwall, TR13 8RB. 2.7 “you/yours” refers to you, the person offering to purchase goods from us. 3.2 Nothing on our website is intended or shall be interpreted to mean that we are making a legal offer to you to provide the goods. We are inviting you to make a legal offer to us to purchase the goods. It is entirely at our discretion to accept or reject the offer to purchase. 3.3 The agreement is concluded only when we have accepted your order by sending you an invoice (with the date of conclusion of the agreement being the date shown on that invoice). 4.1 Payment can be made using any of the methods listed on this website and will be debited when we have accepted your offer to purchase. All prices are quoted in UK pounds Sterling and include VAT. Our acceptance of your offer to purchase goods is subject to their availability. Our acknowledgement of order acceptance via web or e-mail is not a guarantee of delivery. We will inform you if we are unable to deliver the goods that you have offered to purchase. No money will be taken unless goods are dispatched and invoiced. In the event that we are able to supply some but not all of the goods on the Order Form, the whole amount for all the goods on the order form will be taken from your credit or debit card but a full refund will then be made, on dispatch, for the unavailable goods. We make every effort to ensure the descriptions and price of goods are correct. We will inform you as soon as possible in the event of an error in pricing or description coming to our attention. Where we notify you of such an error, you will have the option of either (i) confirming your offer to purchase subject to the corrected description and/or price, or (ii) retracting your offer to purchase and receiving a full refund if the goods have been paid for. All UK purchases are shipped using APC Couriers tracked and signed for services. European and overseas orders are shipped using Royal Mail International Signed For services and shipping times are dependent on destination, if you have any queries about this please contact us at time of purchase and we will be happy to help. Orders placed on weekdays after 3pm and orders placed on a Saturday or Sunday will be dispatched the next working day. Please allow up to 10 working days for items which require engraving. Please note, working days do not include weekends, Bank holidays or Public Holidays in the UK. Scottish Highlands, Scottish Islands and Northern Ireland are not covered by the next day service, orders to these destinations will be sent using Royal Mail and we would ordinarily expect delivery to be 2-3 days although that cannot be guaranteed. Shipping prices are calculated at checkout according to destination. If you are placing an order from outside the UK and have any queries regarding price and transit time please contact us when placing the order. Andorra, Antigua and Barbuda, Argentina, Austria, Australia, Aruba, Bosnia and Herzegovina, Bangladesh, Belgium, Bulgaria, Bermuda, Brunei Darussalam, Bolivia, Brazil, Bahamas, Belarus, Belize, Canada, Chile, China, Colombia, Costa Rica, Cyprus, Czech Republic, Denmark, Dominican Republic, Ecuador, Estonia, Spain, Germany, France, Georgia, Guernsey, Gibraltar, Greece, Israel, Italy, Hong Kong, Honduras, Croatia, Hungary, Ireland, Isle of Man, India, Iceland, Jersey, Jordan, Japan, Cambodia, Korea (South), Cayman Islands, Liechtenstein, Lithuania, Luxembourg, Latvia, Morocco, Monaco, Moldova, Montenegro, Macau, Malta, Mexico, Romania, Russia, Netherlands, Norway, New Zealand, Panama, Peru, Sri Lanka, Poland, Puerto Rico, Portugal, Paraguay, Serbia, Switzerland, Sweden, Singapore, Slovenia, Slovak Republic, San Marino, United Kingdom, Thailand, Turkey, Trinidad and Tobago, Taiwan, Ukraine, United States, Uruguay, Vietnam, South Africa, Finland, Guatemala, Philippines. At the moment we are unable to accept orders from countries other than those specified above. AVAILABILITY AND AUTHORISATION. All deliveries are subject to stock availability and authorisation of your payment. SIGNATURE ON RECEIPT. A signature will be required on delivery of the goods. Receipt of a signature at the delivery address will be proof that the order has been delivered to you. No duty applies to goods shipped within the European Union. Outside the EU any duty and customs costs appropriate to your country are not the responsibility of Little Star Jewellery. At Little Star Jewellery we want you to be satisfied every time you shop with us but we know that sometimes an item might need to be returned and our policy is outlined below. Please make sure you read and fully understand the terms. We are happy for you to return items within 14 days of the order being delivered for a refund or replacement as long as the item and packaging are in the same condition they arrived in, as Little Star Jewellery reserves the right to refuse a refund or exchange if the goods are not returned in the same pristine condition in which they were sent. Please note Earrings will not be replaced if they have been tried on for hygiene reasons. Personalised and engraved items cannot be returned unless they have an original manufacturing fault. Make sure you write your name, address and order number on the returns form we will email you and enclose it with your goods and original dispatch note. Ensure your goods are placed within a securely wrapped parcel. Please note your parcel is your responsibility until it reaches us, so we recommend using a registered or recorded postal service. However, you must cover all return postage costs. Please allow up to 10 working days for your exchange or refund to be processed. During very busy periods this may take up to 14 working days, but we’ll make sure we process it as quickly as possible. If you are returning the product because of an error on our part or manufacturing fault, Little Star Jewellery will be happy to refund all costs associated in returning the item back to us, as well as your original postage costs. Please note Little Star Jewellery will send email confirmation upon receipt of any product returns. All queries should be emailed to us at [email protected] and are generally dealt with within 48 hours. If we need to investigate your query further we will advise you. Credit/Debit card payments will be processed using the services of Sage Pay and Elavon. Our prices include VAT at the standard UK rate. We do not gather or hold personal information about you unless you have given your express permission for us to do so. By placing an order, you will consent to the use of such personal information. Any personal information held or processed will be kept up-to-date and will be destroyed as soon as the reason for its collection or processing has lapsed. No personal data about customers will be passed to any third party, except to fulfil the delivery of the goods to you, and as is necessary to process credit or debit card payments. Your privacy and confidence will be respected at all times. Our system is designed so that sensitive information about orders is never transmitted insecurely. We do not see your credit/debit card details as they are submitted to your bank to obtain payment using SSL encryption technology. Your information may be provided to third party service providers for the purpose of processing your offer to purchase the goods. We may use your e-mail address to provide you with information on products, services, promotions and special offers where you have indicated that this is acceptable by signing up for the newsletter. We will not sell or pass your details to third party organizations except for the purpose of processing your offer to purchase the goods. By making an offer to purchase goods you consent to the information you provide to us being processed for any of the above purposes. Cookies are small pieces of information that are sent from your browser to our web server. On this website cookies are used to keep track of the items you place in your shopping basket. We do not store any personal information in the cookie; they are designed only to collect information of an anonymous nature. We will not combine such anonymous information with your personal details. On your written request, we will (within 40 days of such a request being received by us) supply to you details of the personal information that we hold about you. You must explain to us clearly the information you require to be supplied: we are not obliged to supply to you information that is not specifically requested by you. Under the terms of the Data Protection Act 1998, we are entitled to charge you £10.00 for the provision of information following our receipt of such a request. Once we have received your written request and payment of the fee, we will respond to your request within 40 days. You should note that, under certain circumstances, we are not obliged to disclose the requested information to you, in which case we will explain to you clearly the reasons for our refusal. Under the Distance Selling Regulations, you have 7 working days from the Commencement Date (known as “the cooling-off period”) in which to cancel your order if for any reason you are not happy with the goods that have been delivered to you. This cooling off period begins on the day after the day you receive the goods from us. If you wish to cancel your order, you must notify us of this fact in writing and send your notification to us by e-mail or post. If your notification of your wish to cancel or vary your order arrives with us after your order has been processed, picked and packed, it will be too late to prevent it being delivered and you will need to return it after delivery. On cancellation you must return the goods that we have delivered to you. On our receipt of the returned goods, we will exchange the goods or we will refund to you the price you paid for the goods. Unless you originally received substitute goods, you will be liable for the costs of returning the goods to us, and we will not reimburse you for this. You should return such goods in accordance with our returns policy. THIS IS IMPORTANT: CLAUSE 10 CONTAINS PROVISIONS WHICH RESTRICT THE EXTENT TO WHICH WE ARE LIABLE TO YOU FOR ANY LOSS YOU MAY SUFFER IN CONNECTION WITH THE GOODS. PLEASE READ IT VERY CAREFULLY AND DO NOT MAKE AN OFFER TO PURCHASE THE GOODS UNLESS YOU ABSOLUTELY AGREE TO THIS CLAUSE. 10.1 Nothing in these terms and conditions is intended to exclude any provision of the Unfair Contract Terms Act 1977, or of the Unfair Terms in Consumer Contracts Regulations 1999, or of any other legislation designed to ensure that the rights of parties to a contract of the type of this agreement (i.e. standard terms and conditions which are not individually negotiated) are fairly balanced. 10.2 Subject to the aforesaid, we shall not be liable to you for any loss or damage unless such loss or damage arises as a direct result of our negligence, recklessness or wilful misconduct, or fraud or misrepresentation on our part. 10.3 To the fullest extent permitted by applicable law, we disclaim all liability for our employees’ or sub-contractors’ negligence. 10.4 We may include links from time to time from our website to other sites. We have no control over the content of such sites and disclaim any liability in respect of your use of such sites. 10.5 All conditions, terms, representations and warranties relating to the goods that are not expressly stated in this agreement are hereby excluded to the fullest extent permitted by law. 10.6 Our total liability to you in respect of any claim by you arising out of, or in connection with, the provision (or the failure to provide) the goods shall be limited to the value of the goods supplied. 10.7 No claim by you against us shall be valid unless you have notified us of the details of the claim within 1 year of it arising. 10.8 Every provision of this clause 10 excluding or limiting liability shall be construed separately, applying and surviving even if for any reason any of these provisions is held inapplicable or unenforceable in any circumstances, and shall remain in force notwithstanding the expiry or termination of this agreement. 10.9 Safety Notification – Earrings and jewellery with any small parts are not suitable for children under the age of 3 to be unsupervised with, as it may be a choking hazard. We strongly recommend that jewellery not be given to unsupervised children under 3 years old. Jewellery should not be worn for play and for extended periods on young children, it should also not be worn whilst sleeping. We have used reasonable care and skill in compiling the content of Littlestarjewellery.com but make no warranty, express or implied, as to the nature or accuracy of any material on the website and cannot accept liability for any particular material on the website or as a result of any use of or reliance placed upon information contained within the website. Although we make every effort to ensure complete accuracy, some prices or details shown on the website may change from time to time, and it is possible that errors will occur. We will rectify any errors as swiftly as possible. 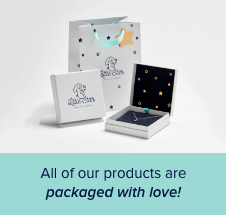 The entire content of this site including all jewellery design, copyright, trademarks and other intellectual property rights and other property rights it contains remain the sole property of Little Star Jewellery. You may store, print and display the content supplied only for personal use. You are not permitted to publish, manipulate, distribute or otherwise reproduce in any format any of the content or copies of the content which appears on the site. Nor may you use any such content in connection with any business or commercial enterprise. If you have any queries about these terms and conditions, or any other aspect of our website, or you have a complaint you can contact us at [email protected] or write to us at: Little Star Jewellery Ltd, PO Box 8332, Ashbourne, DE6 9DR. We respond to any communication as quickly as we can. The Agreement shall be governed by and construed in accordance with English law and you agree to submit to the non-exclusive jurisdiction of the English courts. You are responsible for compliance with any applicable laws of the country from which you access our website.